Barry Colter / Nov. 20, 2017 – The Barra MacNeil’s national Christmas tour makes its way from coast to coast again this year, starting on Vancouver Island November 20, followed by a long string of additional dates across Canada; finishing up in Glace Bay (NS) at the Savoy Theatre on Saturday, December 23. The Barra MacNeils touch down in Cranbrook, Tuesday, November 28, at the Key City Theatre. 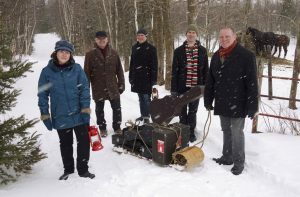 An East Coast Christmas with the Barra MacNeils features the five Sydney Mines musical siblings with a new show full of seasonal favourites, original tunes, songs, stories and dance – all with their unique Celtic spin. A family tradition for many, the show is a perfect way to celebrate the musical magic that the holidays can bring. The multi-award-winning group is currently working on a new album – due for release in the spring. The release entitled On the Bright Side will feature new recordings of both original and traditional music with the first single out in early December just in time for their tour. A limited release 3-song sampler will be available ONLY at their live shows on the Christmas tour. The Key City Theatre and Western Financial present the Barra MacNeils’ Celtic Christmas, Tuesday, November 28, at 7:30 p.m.
Tickets are $35 Regular, $29 for Big Ticket Plus Members, $25 for Big Ticket Members. Tickets are available at the Key City Theatre Box Office 250-426-7006 and online here.